Thousands of indigenous people from across North America came to the Enoch Cree Nation for the Alberta Indigenous Games, six days of sport, education, and cultural awakening. The theme “Reclaiming Our Youth” celebrated the Circle of Courage philosophy for developing healthy children, families, and communities. A street-wise boy is unaware that his younger brother has been using clever manipulation to get him into trouble. Parents are the best source of data on their children but are seldom enlisted as full team members in the search for solutions. Too often, schools have an uneasy relationship with parents, and residential programs try to keep them at bay. Practical guidelines are provided for building partnerships with families. Illinois has been a leader in mobilizing communities to transform justice policies that damage the futures of children and families, particularly those from diverse racial and ethnic backgrounds. Families whose children and youth face emotional, behavioral, and mental health challenges have a powerful voice in this national network of family-run organizations. It is necessary as change agents that we align with the family and provide the necessary skill and support for protection and development of their children. Today, many young persons are taking on adult responsibilities normally filled by the parent. How do we support and develop strengths in these youth and families? Secure settings often compromise goals of care when safety concerns produce a coercive, depersonalized environment. Such programs can be re-designed to meet developmental needs, including maintaining close bonds with the family. Parental Monitoring or an Invasion of Privacy? Technology is providing more ways for parents to keep tabs on their kids. Does this surveillance foster positive behavior or fuel distrust? All professionals serving youth are challenged to engage with their families. 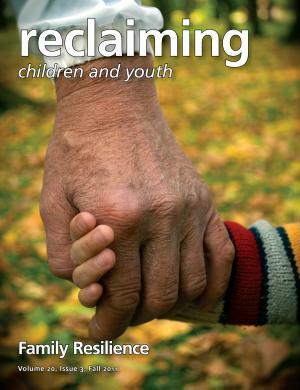 The movement to family-focused residential care is transforming our thinking about families. Through parent-to-parent sharing of experiences and knowledge, the G.E.A.R. Parent Network empowers families to better meet their children’s needs. This article shares wisdom gained by families who are advocating for their special needs children. Four strength-based Re-ED strategies are applied to strengthening families: trust, competence, self-control, and joy. The author was only 15 when she wrote her first article for this journal, the moving saga of losing her mother to cancer (Freado, 2008). Now she shares an inside view of resilience as seen across three generations of her family.